As a nod to the 1960’s Bay Area’s psychedelic and electronic explorations, Sollars will be sourcing the Internet Archive’s psychedelic screen savers, live recordings of the Grateful Dead, and psychotropic literature while utilizing “slow movement” methods of pickling and preserving for handling data. Presented in conjunction with Jewish Folktales Retold: Artist as Maggid, on view Sep 28, 2017–Jan 28, 2018 at The Contemporary Jewish Museum, San Francisco. Exhibition Brochure and essay by Jacki Headley Gallery Director Kelly Lindner. Now on view at the newly opened Jan Shrem and Maria Manetti Shrem Museum of Art at the University of California, Davis, HOOF & FOOT: a field study is a video installation by Bay Area artist Chris Sollars. Drawing on the interactions of students and animals on the campus of UC Davis, home to a world renowned school of veterinary medicine, Sollars engaged UC Davis faculty and students in exploratory conversations regarding the body, socialization, and the confrontation of conflict. For the resultant video installation, Sollars has paired actions by humans and animals, drawing correlations between observable behaviors and movements. We also talk with artist Chris Sollars about his exhibit in the University Art Gallery at Chico State. The exhibit showcases Sollars' sculptures & performance-art videos including "Daaam" which documents the artist's trek from Oroville Dam to downtown Oroville -- while he was dressed as a tree to highlight drought & environmental issues. Also on view, “Hoof & Foot: A Field Study” by Chris Sollars, is a witty video installation that draws visual analogies among the animals, four-legged and two, of the UC Davis campus. Bay Area artist Chris Sollars brings imagination and humor into play across his multimedia exhibit, DAAAM, currently on display at Chico State’s Jacki Headley University Art Gallery. For instance, Sollars creates sculptures by combining found objects, such as a rusted jerry-can topped by a weathered piece of Lake Oroville driftwood for “Pour.” For another piece, “Fake Lake,” he cut a map-like shape of Lake Oroville from a piece of plywood set into the top of an old wheelbarrow filled with water from that lake. On the contemporary side, San Francisco-based artist Chris Sollars contributes a video installation to the new museum, titled Hoof & Foot: A Field Study, in honor of the university’s hoofed residents (subjects of the agricultural and veterinary programs) — and the humans who study them. San Francisco based artist Chris Sollars, opened a new exhibit entitled “DAAAM” in the University Art Gallery on Thursday. Students, staff and community members were invited to listen to Sollars talk about the new exhibit and ask questions. A playful yet poignant showing by Sollars for his culminating exhibition after being in residence at Recology, which requires use of only discarded materials. Sollars presents five videos with accompany props, scenes and costumes. Dystopic futuristic worlds are built out of chance encounters with other peoples' waste, yet despite the built-in happenstance (what will come out of that trash pile??) overall themes emerge. For example, a video viewed through a pair of snorkel goggles---embedded in blue plastic bins, shows Sollars as a diver as he jumps into blue recycling bin and then cuts to POV shots of Sollars ‘swimming’ through a sea of blue colored plastic waste---could easily be a PSA, and perhaps that is why I enjoyed it so much. Multimedia artist Chris Sollars has long engaged with the watery edges of San Francisco, but nowhere so completely as in his 2013 solo show at Steven Wolf Fine Arts, The Swimmer. Works in the delightfully-deadpan exhibit included barnacle-encrusted objects, documentation of Sollars walking the entire San Francisco coastline from Candlestick Point to Ocean Beach and a video inspired by John Cheever’s short story “The Swimmer,” in which Sollars traverses the city via bodies of water, from public swimming pool to dinky plaza fountain. 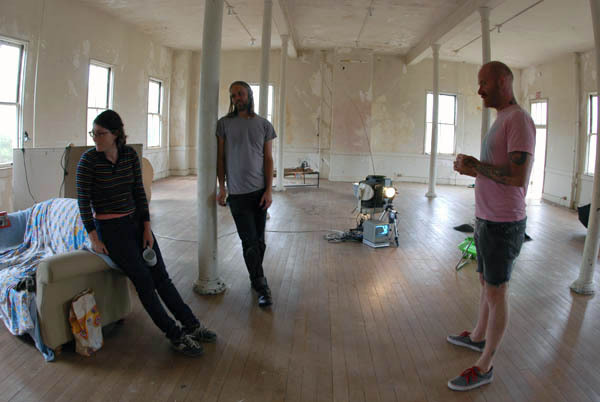 After four months of scavenging materials from the Recology dump, resident artists Jenny Odell, Chris Sollars and student artist Roger Ourthiage Jr. present three solo exhibitions over the course of one weekend. Odell’s The Bureau of Suspended Objects, a fictional archive of things once used, now discarded, includes scanable QR codes, collages and information gathered by the artist on each object. For Sollars’ Castaways, scavenged material becomes props and backdrops for video works, with the artist acting as playful protagonist. Mills College welcomed Chris Sollars as the new assistant professor of studio art in the Fall of 2015. Sollars’ work is described on his website as “the reclamation and subversion of public space through interventions and performance.” Documented through photography and video, his work is then turned into mixed media installations. The art of walking is often a melancholy one. Its slowness breeds languid reveries, intense brooding, and earthbound ponderings that can tend toward a state of paralysis. However, art walks are typically anything but lethargic. Two (un)related walks conveniently bookended my summer: a river walk and a campus walk. Both probed the relation between memory and landscape: one, on the summer solstice, retraced the course of San Francisco’s undergrounded Mission Creek from source to sea, while another meandered around the legendary UCSC Farm and was punctuated with somewhat extemporaneous presentations by current and former apprentices. Local artist Chris Sollars has been investigating the outdoors for years. In 1997 he started taking his work out of the studio and putting in into the streets in an effort to have art within a real space. He's worked in sculpture, performance, video, and, unexpectedly, water. He even says that he's swam across San Francisco, from the bay to the ocean, through a network of pools and fountains. Not entirely sure how that works, but intrigued? So was Southern Exposure, the gallery who invited Sollars to be a part of their summer series, Off Shore. “The Swimmer,” Chris Sollars’s first solo show for Steven Wolf Fine Arts, features photos, videos and sculpture, all in homage to the San Francisco coastline, and its duality of water, Ocean and Bay, that shape the city. The sculptures in the show are all pulled from these shores; shopping carts, bikes, 40 oz bottles and cinderblocks meticulously cleaned to exhibit the saltwater’s own addition–colonies of barnacles living on our trash, like so many low rent tenants filling in the converted studios and improvised accommodations of coveted real estate, only to be yanked up and out, evicted by the fate of their discovery. Bicycle encrusted with SF Bay barnacles in Chris Sollars' "The Swimmer"
Inspiration can come from many places, and in Sollars’ case it came from San Francisco Bay. As in literally from the bay: He dragged something from the water and used it in his work. The thing he dragged out was a bicycle frame, beautifully encrusted with barnacles. It was being kept in Davy Jones’ bicycle locker, apparently. 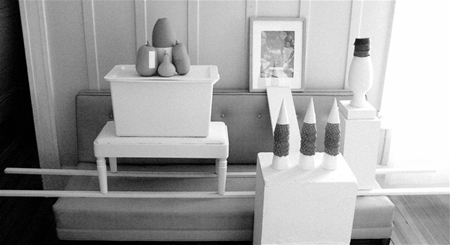 Sollars' sculptural practice overlaps with photography, video, collage and installation work. The Swimmer reflects on journeys and investigations along the Pacific coast. 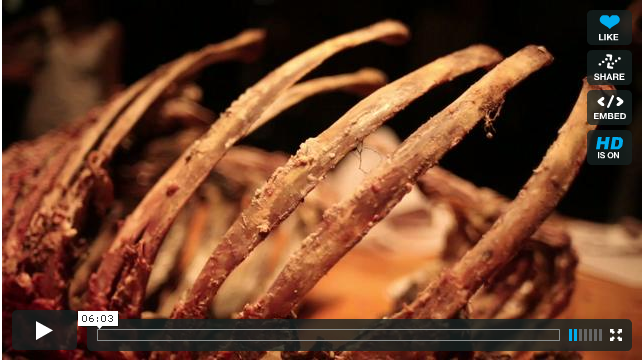 Story telling and altered sculptural objects constrast clean, geometrical driven video work. Both directions melt together and weave a narrative in Robert Smithson style. Chris Sollars' The Swimmer Trailer is released as an easter egg hidden feature on the Blu-Ray re-release of The Swimmer starring Burt Lancaster. From the beginning, Sollars’ video art has been ambulatory. In his very first video piece from 1997, the artist records himself as he wheels a bucket full of soapy water around the city, picking up trash off the street, washing it, then carefully replacing the trash as he found it. Shaving his beard with an axe. Washing trash in the street. Chris Sollars does the strangest things for the sake of art, but they work. Sollars has exhibited his video, photography and sculpture projects around the United States -- including at SFMOMA, Yerba Buena Center for the Arts & last month was awarded a prestigious grant from the John Simon Guggenheim Memorial Foundation. For San Francisco-based performance artist Chris Sollars 98 SC, winning a 2013 Guggenheim fellowship means spending less time teaching and more time focusing on his own projects. 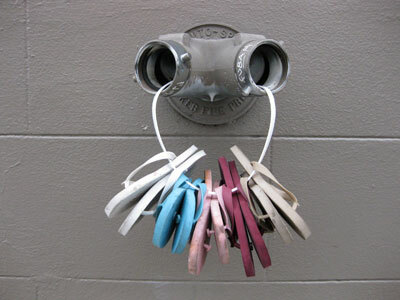 Since his days in the RISD Sculpture department, his work has centered around street performance documented with video. “I started doing performances because I wanted a direct and immediate encounter with the public,” he says. Karnig: What are your inspirations? Sollars: The street and the immediate space around me influences my ideas directly. My work takes inspiration from a range of art from Bruegel & Durer, to Duchamp to the Diggers & Yippies; Fischli/Weiss, Gordon Matta-Clark, Nauman, Chris Burden, David Hammons, Ana Mendieta, Paul McCarthy. Pipilotti Rist, Kim Jones, Acconci, Adrian Piper, Kaprow, Paul Kos, Bruce Conner and other 60 & 70s artists: that showed or made their work within the world / public spaces immediately within everyday life and often using their body as material. All my early videos in the street of performances are also influenced by Skate videos I grew up watching in the mid 80's to early 90's. Chris Sollars is a Mission-based artist whose work was picked for both the SFMOMA SECA Award and YBCA’s Bay Area Now show. He started his gallery as a response to the disappearing art spaces in San Francisco during the dot-com boom. 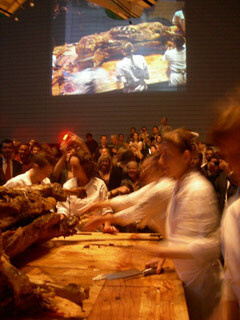 The first event was A Site Launch in 2001, parodying the extravagant tech parties of the 1990s. 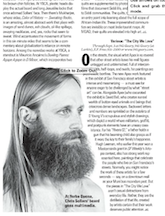 For the last year, Bay Area artist Chris Sollars has sported a biblical behemoth of a beard, although his cleanly shaven cheeks are once again on view in Sollars’s newest project, Hairy, on view as part of YBCA’s Bay Area Now. It’s an interesting update on an identity-probing lineage that includes predecessors like Chris Burden, Gordon Matta Clark, James Luna, Ana Mendieta, and David Hammons. DailyServing recently had the opportunity to chat with Chris about the work. For …might be good, Sollars presents a series of works from 1980-2040 juxtaposing time, physical and social space.. Through humorous interventions and performances, Chris Sollars calls attention to the things we throw away. Rather than telling the viewer what to think about trash, Sollars’s goal is to stimulate curiosity as a way of encouraging us to rethink the everyday world and consider the importance of the invisible and overlooked. In Play-Fill, Sollars creates a situation in which visitors are asked to think about the world from the perspective of a piece of trash. By refocusing our point of view, Sollars spotlights a critical topic we would rather ignore and makes it personal. 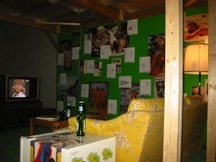 There were a number of artworks that I found interesting, such as Tammy Rae Carland’s staged photographs of stand-up comediennes in comic repose; Ben Venom’s outsize Medusa-head quilt fashioned from heavy metal paraphernalia; and Chris Sollars’ refreshingly bizarre and hirsute multimedia installation, to name a few. Sollars is a kind of clown prince, going for laughs and provocation with his hair-themed art, including a video that has him rubbing his long beard against an ax and removing odd objects (toy baby, Star Wars figure, earbuds, lighter) from inside his brown chin follicles. Chris Sollars’ multi-channel performance/video installation, Hairy, is about hair—more specifically his hairiness and eventual hairlessness—and veers between offbeat humor and unsettling violence; it ends with an almost ritualistic, bloody beard purging in the woods with an axe blade. Sollars is a kind of clown prince, going for laughs and provocation with hi hair-themed art, including a video that has him rubbing his long beard against an ax and removing odd objects (toy baby, Star Wars figure, earbuds, lighter) from inside his brown chin collicles. At YBCA, glass heads display the actual beard and long Jesuslike locks that once adorned Sollars' face. There are a lot of great artists showing at YBCA's BAN6 showcase, but I found it really hard to pull myself away from Chris Sollars' Hairy exhibit. This Saturday Chris celebrates the art of "unruly facial hair" with a live event that features something that goes well with beards in this town — drinking whiskey! Between 5 and 7 p.m., you can get the growth on your mug sculpted, trimmed, and otherwise perfected while sipping brown booze cocktails crafted by Comstock Saloon. Drawing Crowds bravely waded into a gathering of hirsute men (and the people who love them) having their facial hair massaged into wacky shapes as part of Yerba Buena Center for the Arts Whiskey Waxing event, designed to accompany the ongoing exhibit, Bay Area Now 6. Two segments in particular point to a critical aspect of Arthur/Allan’s reflexive process. Books by Allan on Arthur and Books by Arthur on Allan show the duo in a library, stacking books and fitting the namesake criteria on one another’s bodies. While the activity is schoolboy unruliness, as a metaphor, it enacts the reciprocal attention and validation that bolsters good ol’ boy networks and gray area ethics possible in any system of power. Curator Aimee Le Duc gathers photos, videos, performance and installations by local artists - Matthew Kennedy, Kristina Lewis, Jasmin Lim, Brion Nuda Rosch, Chris Sollars and Lindsey White - examining the common, the ordinary, the banal. Meanwhile, tricksters Brian Nuda Rosch and Chris Sollars have given themselves the official-sounding name Arthur/Allan for their project as they investigate San Francisco civic buildings. 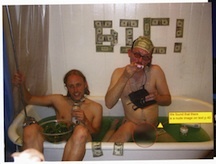 They play with the idea of unoccupied space in the city through a series of humorous actions they share in the show. Viewers may not be willing to jump until they no longer can, like Matthew Kennedy in Jumping, 2010; use their bodies as bookshelves, like the collaborative Arthur/Allan in one of their videos from City Hall, 2011; or edit video down to its best moments, like Lindsey White in Common Senses, 2009-11; but they could if they wanted to. We invited 75 people from the Bay Area creative community with a passion for artworks in SFMOMA's collection to tell us about their favorites in 75 7.5-minute talks spread over three days. This summer Brion Nuda Rosch invited Chris Sollars to the SFMOMA to make works using only materials found within the museum. At no point were museum staff made aware of Sollar’s “residency”. We applaud low cost-high concept art. This past summer at SFMOMA, artist and curator Brion Nuda Rosch invited Chris Sollars to use SFMOMA as a site for art-making. The one catch? the artist had to use materials on hand in the museum itself, from paper products, posters, bottles, debris left behind, to the shirt off his back. We applaud low cost-high concept art. This past summer at SFMOMA, artist and curator Brion Nuda Rosch invited Chris Sollars to use SFMOMA as a site for art-making. The one catch? the artist had to use materials on hand in the museum itself, from paper products, posters, bottles, debris left behind, to the shirt off his back. .
Guerilla: Rosch, Brion Nuda. “Chris Sollars: Museum Residency.” SFMOMA Open Space, August 20, 2010. Brion Nuda Rosch and Chris Sollars. 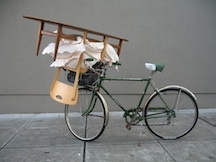 "Arthur Allan," 2009; collaborative project, Hallway Projects and 667Shotwell. Courtesy of Hallway Projects and 667Shotwell, San Francisco. Chris Sollars new solo show at WE Artspace, titled “ri-FLEKT,” adventurously explores (and alters) the ways the small Oakland venue interacts with the surrounding urban landscape. The artist swapped the bus stop bench outside the venue with the couch that usually occupies the inside, augmenting each object to bring out the elements of each respective environment. A blanket with the portrait of Charlie, the WE Artspace dog, lays on the outdoor couch while Charlie herself can be found inside, a few feet away. Meanwhile, the bus stop bench occupies the bulk of the interior’s floor, a sheet of shiny plastic reflecting the walls while a recording of traffic sounds plays on a stack of speakers.. In light of cooperative creation’s many pitfalls, the success of “Arthur Allan,” is surprisingly refreshing. Developed collaboratively by Brion Nuda Rosch and Chris Sollars, the show not only combines their respective art practices and residential art spaces—Hallway Projects and 667 Shotwell—but also embraces the neighborhood and objects situated between their two homes. 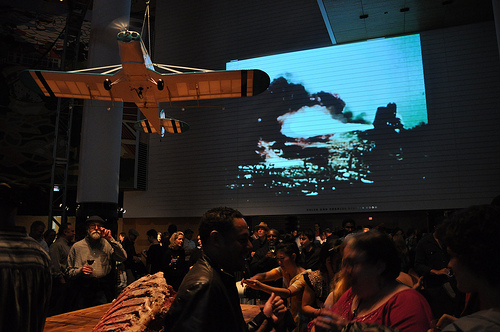 The room was full of controlled chaos and cacophony, with video projections on the walls by Chris Sollars, air raid sounds and live audio by sound artist Matt Volla and composer Luciano Chessa, dark and dramatic lighting, and a huge tapestry of the manifesto that originally covered the steer was eventually hung from the second story; afternoon. Oh. My. God. Ohmygod, ohmygod, ohmygod. OH. MY. GOD. That's what kept racing through my mind as I watched a 650-pound spit-roasted steer get lifted out of a bicycle-powered trailer and unwrapped on an equally massive butcher-block table at the latest OPENrestaurant event this past Saturday October 17th. Kyle and I opted for the Center for the Arts and we were in luck because when we got there, Chris Sollars (middle), one of the artists in residency was there and invited us up for coffee and a tour of his studio. The studio was incredible; a giant pillared squat-like ballroom with raw paint cracking walls, and windows spilling in natural light on Sollars' sparse, neatly-placed installations. New York Foundation for the Arts: Redefining the narrow concept of suitable exhibition space, artist-run projects are booming right now, with work being shown in apartment halls and bathrooms, in buildings in transition, and in artists' studios across the country. Emily Warner reports on new projects in New York, San Francisco, and Chicago, and speaks to the key players in these renegade initiatives. A moving and beautifully directed documentary short that explores the emotions of San Francisco-based Indians living abroad in the wake of the terrorist attacks on Mumbai in November 2008. Directed by Chris Sollars, a project of 667 Shotwell Films, and produced by Amit Botadkar, Dushyant Agarwal, Poojan Shah. On November 4, we’ll be screening two democracy-themed projects by Bay Area artists. 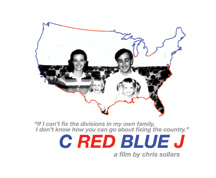 Chris Sollars’ documentary C RED BLUE J explores the red state/blue state divide of 2004, as Chris juggles his beliefs with those of a sister working for the Bush administration, a born-again Christian father, and a lesbian mother. I Want You (Auditions) is Tony Labat’s new work, culled from footage of the original I WANT YOU performances. I asked them to interview each other for the blog & they typed their conversation together in real time in Tony’s studio Weds afternoon. 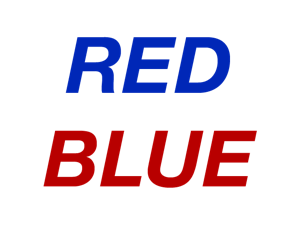 A special election-week Collection Rotation by San Francisco-based artist & curator Chris Sollars, whose experimental documentary C RED BLUE J will be screening in the Wattis theater Nov 4. All works collection SFMOMA & listed in detail at the bottom of this post. Magic 98.1 Atlanta: Afternoon Show w/ Benji June 9, 2004.